SHHH, it’s a secret. 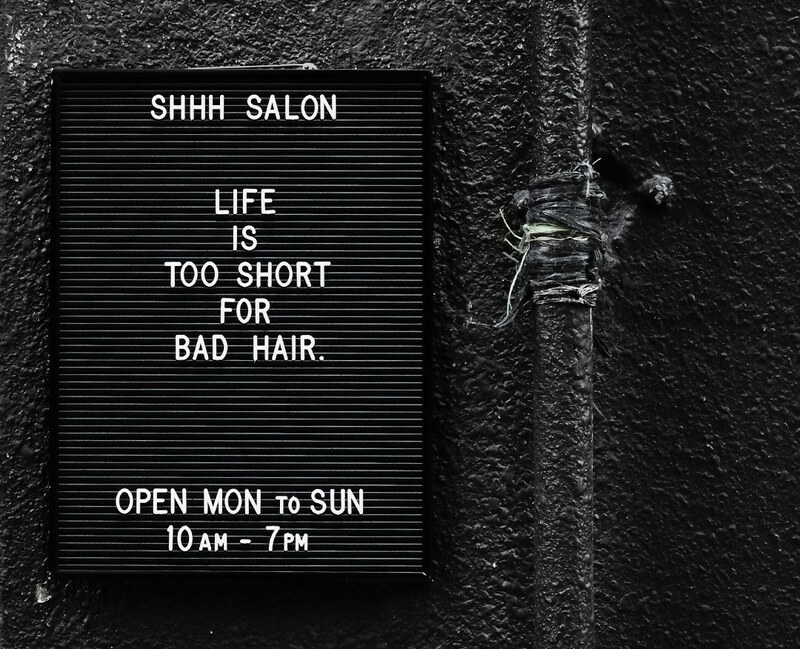 Well, not anymore, thanks to hair expert and SHHH Salon’s Creative Director, Marvin Lin — who also happens to be one of Hong Kong’s most sought-after hair stylists, bringing celebrities, tycoons and even Middle Eastern royalty seeking a good hair day into the salon. 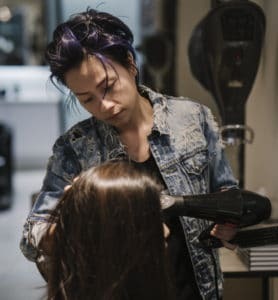 With over 20 years of experience backstage at fashion shows, editorial shoots and commercial productions, Lin knows exactly what it takes to make hair look good on camera. But as a result of her background in haircare and health (her family’s heritage is in Chinese medicine) she also understands how lifestyle can really affect your hair. 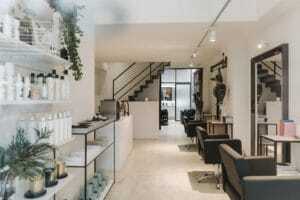 The bright and airy salon is situated on Hollywood Road in Sheung Wan. Lin goes on to tell us that it’s not just the cut, colour or styling product that is needed to achieve great hair, but instead more about resetting the condition of the scalp and rebuilding it on a structural level. This is why she and her team have created their very own haircare line: OMG. There are 8 products in the OMG lineup, which provide different uses for different hair types. 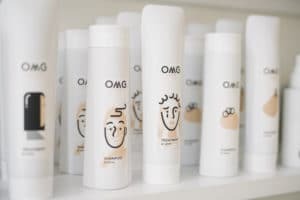 Formulated in a Japanese laboratory with argan fruit stem cells, hydrolysed keratin protein and collagen, OMG has been created to repair and replenish your hair. And the results speak for themselves. We put this to the test and found our hair had been given a new lease on life, feeling instantly healthier, silkier and bouncier with every wash. And guess what — you can achieve all of this at home. Creative Director Marvin Lin working her OMG magic into a client’s hair. Wash your hair as you would normally, and use water (about 38 degrees celsius) to saturate the hair. Lather OMG Scalp Shampoo between your palms and apply to your scalp and hair evenly. Continue to lather from the hairline to the back of your head and neck, until the foam is evenly distributed. Once the scalp feels cleansed, rinse off the shampoo. This step is crucial in cleansing and balancing the scalp. Lather OMG Glossy Shampoo between your palms, apply evenly and gently pull your hair from the roots to the ends. Do this until the hair is clean and then rinse. This step is a deep cleanse and will remove remaining residue from styling products and pollutants. Use OMG Scalp Treatment, about the size of a Hong Kong five dollar coin, and apply evenly on your scalp and hair. For extra regenerative strength, repeat with the same amount of treatment and massage. This step is to directly feed your scalp with the nutrients it needs. A facial for your scalp! Take OMG Glossy Treatment, again about the size of a Hong Kong five dollar coin, and apply evenly on your hair — gently pulling from the roots to the ends to help the product penetrate into each strand. If your hair is long, damaged or you want to give your hair a real boost, you can repeat this with two to three times the treatment amount. Leave the treatment on for 15–20 minutes if you can (depending on the condition of your hair) and then rinse. Towel dry your hair to remove excess moisture and then apply OMG Backstage Blowdry Lotion evenly on hair, about four to eight pumps will do. If your hair is quite long or thick you may choose to top up with a couple more pumps. This step is to protect your hair from moisture loss and static electricity, and to top up with more argan plant stem cells, collagen and hyaluronic acid in preparation for styling. Set the hairdryer to medium to high power and heat, blow dry in the direction from roots to ends, until your hair is about 60-80% dry. Apply OMG Ready to Glow Leave-in Treatment towards the ends and wherever frizz is prone to appear. One pump is enough for medium to long hair, but if your hair is particularly long or thick you may add another. Gently pull from two inches above ends for one to two minutes to help the product penetrate. Once completely absorbed, blow dry until hair is dry and style as usual. The leave-in treatment will provide protection from heat, UV and oxidative damage while giving hair immediate shine. To achieve OMG hair every day, follow this six-step regime after swimming, going to the beach, air travel, bleaching, colouring or perming. And do so once a week, or as often as required for optimal hair maintenance.